We had fabulous time listening to you - it was a great performance and thank you for the same. Although I wanted to request you to introduce your accompaniments, I had declined due to number of people asking questions and you had the time crunch. This may be the only kutchery this season for me as I have to fly overseas in the weekend. 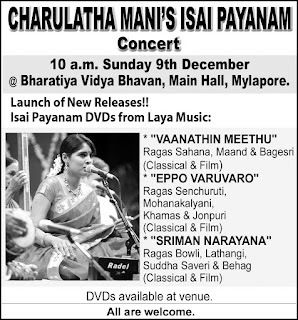 All the best for the rest of the season, please do respond and update your accompaniments from this concert (9th Dec, @10am at Bharathiya Vidhya Bhavan). My special congratulations to the Mridangist, who was magical. New Isai Payanam DVDs from Laya Music are OUT! New Isai Payanam DVDs to be launched! !